The Chariton girls basketball team jumped to a 20-0 start against the Lady Dees leading to a 63-17 margin of victory for the Chargers. The Chargers slapped on an early press and the Dees were plagued with turnovers most of the night. “You just can’t throw over the top of a press and hope to get the ball across the half court line,” said Coach Katy Dykes. Albia had 25 turnovers on the night. Maddy Persons finally broke the scoring drought and Albia went into the half trailing 41-7. The Dees still struggled to convert baskets in the second half, but their play improved behind the defensive and offensive agressiveness of sophomore Danica Workman. “Danica is the smallest player on the court, but was really relentless, even when we were down 40 points,” said Coach Dykes. Workman led Albia with five points. Persons and Rylee Leshen had three each, Taylor Colwell and Allison Major two and Carlie Ford and Halle Hindman one each. 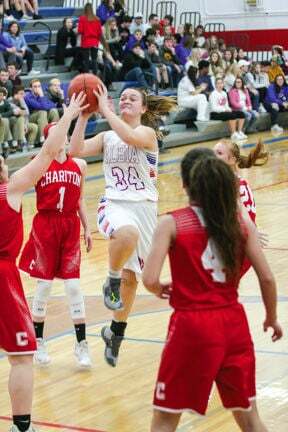 Chariton was led by Macy Johnston with 19, Emma Rector with 16 and Avery Hall with 12. Leshen led the team in rebounds with seven, Persons had four, Colwell three, Workman three, Kaldenberg two and Abbie Martin and Hindman one each. The Dees travel to Centerville on Friday to meet the Redettes. Their record is 3-2. The Dees fall to 0-2 on the season.